On Friday, April 13, 2007, For Inspiration Only offered an interactive lecture on how to Design for Tangible Games at the TU Delft faculty of Industrial Design Engineering, based on the students’ own design postcard concepts. The lecture was programmed by the ID-StudioLab Aadjan van der Helm in the Interactive Technology Design assignment for students of Design for Interaction. In their assignment, a selected set of students was asked to design a tangible game and develop a working prototype for that, using Max/MSP and phidgets. Before the lectures, the students were asked to provide descriptions of their first concepts in the form of postcards. On the front a sketch, collage, scheme or other strong visual teaser for the game concept was to be presented. On the back we asked the students to write about the concept in simple non-tech and non-design terms about what it would be. The presentation method with a real receiver (the addressee) and a divided graphical and textual part really helped as a tool to get the concept and atmosphere explained quickly and expressively. Interactive presentation of the postcards from the session, click through them or use arrow keys. The resulting concepts consisted of many mazes and games that mimic capture the flag in some way. The assignment confined the student in making something that had to be multi-player and without visual feedback. Best concept presentations were made by the students that bended these rules a bit to their liking. The interactive part of the lecture consisted of me giving suggestions on these projects and discussing how to pursue and explore their concepts further. 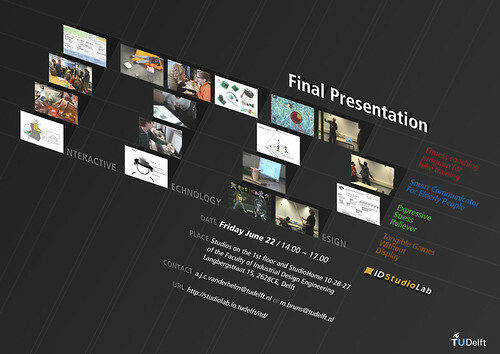 Update: The final presentation will be on Friday, June 22, 2007 with all the results from the Interactive Technology Design classes demonstrating their projects interactively. This is open to those interested by contacting the amazing Aadjan van der Helm.